Even in an increasingly Red vs. Blue nation, the public’s political attitudes and values come in many shades and hues. Partisan polarization – the vast and growing gap between Republicans and Democrats – is a defining feature of politics today. But beyond the ideological wings, which make up a minority of the public, the political landscape includes a center that is large and diverse, unified by frustration with politics and little else. As a result, both parties face formidable challenges in reaching beyond their bases to appeal to the middle of the electorate and build sustainable coalitions. The latest Pew Research Center political typology, which sorts voters into cohesive groups based on their attitudes and values, provides a field guide for this constantly changing landscape. Before reading further, take our quiz to see where you fit in the typology. Discover which typology group you fit into and explore each group’s views on major issues. The Political Typology sorts people into groups based on their attitudes and values, not their partisan labels. It is based on the largest political survey ever undertaken by the Pew Research Center, which also was the data source for our June 12 report Political Polarization in the American Public. The survey was conducted among 10,013 adults from January to March of this year. The report also includes data from follow-up interviews with many of the initial survey’s respondents as part of the Pew Research Center’s newly-created American Trends Panel. Earlier this year, the Pew Research Center conducted a survey of 10,013 adults nationwide as part of a broad investigation of political changes in the nation. The first report on this data focused on political polarization and used 10 survey questions on political values to gauge how ideologically consistent Americans have become on a traditional left-right index. The two approaches complement one another: Most of the Solid Liberals are consistently liberal in their values, and the Steadfast Conservatives and Business Conservatives combined make up nearly all of the consistent conservatives. See Section 1 for a further discussion of how these two approaches relate to each other. Even so, most Americans do not view politics through uniformly liberal or conservative lenses, and more tend to stand apart from partisan antipathy than engage in it. But the typology shows that the center is hardly unified. Rather, it is a combination of groups, each with their own mix of political values, often held just as strongly as those on the left and the right, but just not organized in consistently liberal or conservative terms. Taken together, this “center” looks like it is halfway between the partisan wings. But when disaggregated, it becomes clear that there are many distinct voices in the center, often with as little in common with each other as with those who are on the left and the right. 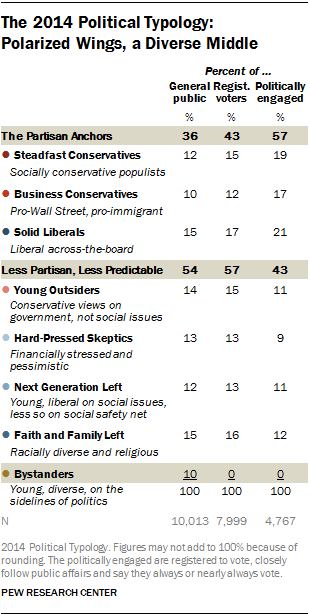 The Pew Research Center’s Political Typology, launched 27 years ago, is an effort to look beyond “Red vs. Blue” in American politics, understanding that there are multiple dimensions to American political thinking, and that many people hold different combinations of values than the predominantly liberal and conservative platforms offered by the two political parties. The new study highlights the challenges that both parties face heading into the 2014 and 2016 elections. Each can count on strong support from the three staunchly partisan groups; Steadfast Conservatives and Business Conservatives on the right, and Solid Liberals on the left. In all three groups, 2014 midterm preferences are comparable to the overwhelming support these groups gave their party’s presidential candidate in 2012. The middle groups in the typology are less predictable. To be sure, the Faith and Family Left and the Next Generation Left favor Democratic congressional candidates this year by roughly two-to-one margins. But they supported Barack Obama by wider margins in 2012, and their 2014 turnout is suspect. One early indicator of voter turnout is attention to government and public affairs, and fewer than half in these groups are following politics, compared with broad majorities in the more ideological groups. And the Hard-Pressed Skeptics – who say they supported Obama over Romney by a 65%-25% margin two years ago – are more closely divided in 2014. As they look toward this year’s midterms, 51% plan to vote for the Democrat in their congressional district, while 37% plan to vote Republican. And the Republican-leaning Young Outsiders intend to vote Republican this fall by a somewhat larger margin (20 points) than they did in 2012 (11 points). Yet these groups also are less certain to turn out this fall compared with the more partisan bases. 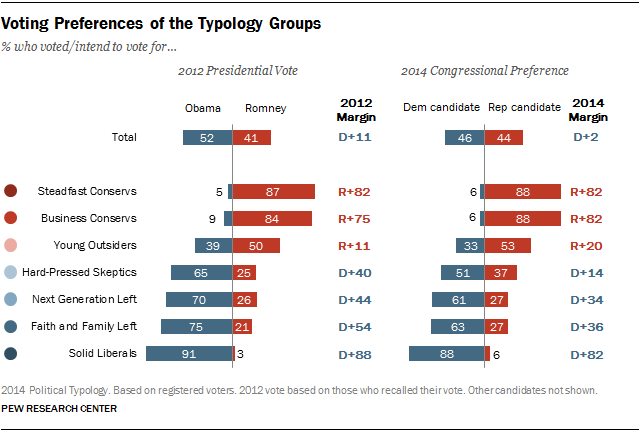 The typology study may have even greater relevance for understanding 2016, both for the nomination contests and the general election. In both parties’ electoral coalitions, there are fissures on some of the most important dimensions in American politics. On the right, coalitional politics are focused on the Steadfast Conservatives and Business Conservatives, both of whom lean Republican by overwhelming margins. Combined they make up about a quarter (27%) of all registered voters. Both groups are overwhelmingly white and mostly male; Steadfast Conservatives are older on average (67% age 50 and older) than Business Conservatives (53%). And while they represent two clearly different wings of the party – one more downscale and pessimistic, one more wealthy and optimistic – both are reliable GOP voting blocs. Steadfast Conservatives and Business Conservatives agree that government should be smaller and play less of a role in the economy. They are unified in their intense opposition to President Obama – fully 94% of Steadfast Conservatives and 96% of Business Conservatives disapprove of his job performance. Notably, nearly identical shares of both groups agree with the Tea Party (55% of Business Conservatives, 53% of Steadfast Conservatives). But these conservative groups differ in three important ways on policy debates that currently divide Republican leaders in Washington. Finally, these two conservative groups differ over foreign policy. Steadfast Conservatives have doubts about U.S. international engagement – and view free trade agreements as a bad thing for the U.S. – while Business Conservatives are more supportive of the U.S. taking an active role in world affairs and free trade. Solid Liberals, who constitute 15% of the public and 17% of registered voters, are the anchor of the Democratic Party’s electoral coalition – the most avid and loyal voters, holding liberal views across nearly all issues. But the party must rely on support from the other Democratically-oriented groups in the typology – the Faith and Family Left and Next Generation Left – to be successful. While each of these groups leans Democratic by wide margins, they diverge from across-the-board liberal thinking in a number of critical ways that have implications for their loyalty and turnout. The Next Generation Left is the youngest of the typology groups. Roughly half (52%) are younger than 40, and this segment characterizes the liberal leanings of the Millennial (and younger Gen X) cohorts: The Next Generation Left embrace diversity, are generally positive about what government can do and are relatively upbeat about their own – and the nation’s – future. Yet in critical ways, the Next Generation Left have clear differences with Solid Liberals. While supportive of government, they have a fairly individualistic take on opportunity and self-achievement. As a result, they balk at the costs of expanding the social safety net – just 39% say the government should do more to help needy Americans even if it means going deeper into debt. 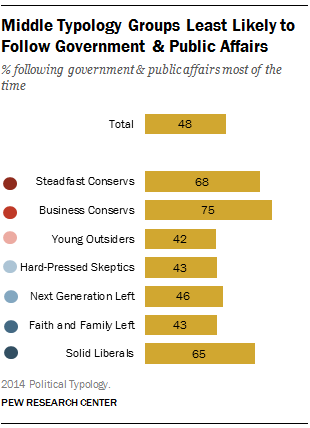 In addition, the Next Generation Left are less skeptical about business than the other Democratically-oriented groups. While they are no more likely than Solid Liberals to have investments in the stock market, a majority of the Next Generation Left (56%) say that Wall Street does more to help the economy than hurt it, compared with 36% of Solid Liberals. The wild cards in the new political typology are the Young Outsiders and the Hard-Pressed Skeptics. Both groups have weak partisan leanings, which are reflected in their early preferences in this fall’s midterms: Young Outsiders favor the Republican candidate, or lean Republican, by a 53% to 33% margin; Hard-Pressed Skeptics plan to vote Democratic by 51% to 37%. Whether many will show up at the polls is an open question: They are less likely than the core partisan typology groups to say they always vote. Nonetheless, Young Outsiders may present an attractive opportunity for the GOP. They are younger and more diverse than Republicans generally. Nearly half are under 40, compared with just 33% among all Republicans. Yet Young Outsiders do not feel very favorably toward the GOP; in fact, nearly as many have a favorable opinion of the Democratic Party (34%) as the Republican Party (39%). Young Outsiders share Republicans’ deep opposition to increased government spending on social programs. About three-quarters of Young Outsiders (76%) say the government can’t afford to spend more to help the needy. However, the Young Outsiders’ generational imprint on issues like homosexuality, diversity and the environment make the Republican Party an uncomfortable fit. In views of societal acceptance of homosexuality, for instance, Young Outsiders have more liberal views than the public overall, and are much more liberal than Republicans. Similarly, Hard-Pressed Skeptics have ambivalent views of the Democratic Party and disagree with Democrats on major issues as often, if not more, as they agree. Hard-Pressed Skeptics face the most difficult financial circumstances of any of the typology groups, More than half (56%) have family incomes of less than $30,000 a year and 67% say they often don’t have enough money to make ends meet. In 2012, Hard-Pressed Skeptics say they voted for Obama over Mitt Romney by more than two-to-one (65% to 25%), but today just 44% approve of the way Obama is handling his job as president; 48% disapprove. Hard-Pressed Skeptics are not in sync with mainstream Democratic thinking in views of Obama’s major policy initiatives – just 40% approve of the Affordable Care Act. And they take more conservative views on social issues, such as homosexuality and abortion, than do rank-and-file Democrats generally. So why do Hard-Pressed Skeptics remain in the Democrats’ camp, however marginally? In part, it may be because of their strong support for increased government social spending. Even though they take a dim view of government performance, 66% of Hard-Pressed Skeptics say the government should do more for the needy even if it means adding to the debt. That is little different from the 61% of all Democrats who favor more aid for the needy. And while Hard-Pressed Skeptics are not enthusiastic about the Democratic Party, in some ways they are even more critical of the GOP. For instance, about half of Hard-Pressed Skeptics (53%) believe that the Democratic Party cares about the middle class. But just 26% say the same about the Republican Party. The Pew Research Center created its first political typology in 1987, when President Ronald Reagan was reeling from the Iran-Contra affair and the front-runners for the upcoming presidential election were Sen. Gary Hart for the Democrats and Vice President George H.W. Bush for the GOP. Much has changed in politics over the past 27 years, of course. But some of the same fissures we identified in that first typology are still evident today. Today, Business Conservatives hold much more liberal positions on homosexuality and morality than do the other largely Republican group, Steadfast Conservatives. In 1987, Enterprise Republicans were much more tolerant than Moral Republicans on many of the social policy issues of the time, such as whether or not school boards should have the right to fire homosexual teachers. On the left today, the majority-non-white Faith and Family Left is highly religious and has much more conservative attitudes about the acceptability of homosexuality and abortion than do the Next Generation Left or Solid Liberals. But this same fissure existed in the late 1980s between what we then described as the Partisan Poor and Passive Poor and the more upscale 60s Democrats and Seculars. Every Typology study between 1987 and 2014 has found a very downbeat, financially stressed group who is skeptical of government, yet supports the programs that assist people facing economic disadvantages. Over time, we have referred to them as the Disaffected, the Embittered or today the Hard-Pressed Skeptics, and their political leanings have varied with administrations, issues and economic conditions. But not all has been constant in the Political Typology, reflecting changing generational, demographic and political contexts. An anchor of the Democratic Party in 1987 was the New Dealers, representing the generation raised during economic strife and World War II. With the New Deal generation largely gone, the Democratic coalition now leans heavily on the Next Generation Left, who are more socially liberal than their predecessors, but also somewhat more economically conservative. And the appearance of the Young Outsiders is a new group in the political landscape. Previous typology studies have found right-leaning groups, such as the Pro Government Conservatives in 2005, who proved critical to George W. Bush’s reelection. Drawn to the GOP coalition by the party’s positions on security issues and morality, they otherwise supported a more expansive view of government and social programs. The Young Outsiders today are very different, as they share the GOP base’s deep skepticism of government programs, but favor a more limited foreign policy, and hold decidedly liberal social views. This is the second report of a multi-part series on political polarization based on a national survey of 10,013 adults nationwide, conducted January 23-March 16, 2014 by the Pew Research Center and funded in part through grants from the William and Flora Hewlett Foundation, the John D. and Catherine T. MacArthur Foundation and supported by the generosity of Don C. and Jeane M. Bertsch. The first report, released June 12, focused on the nature, scope and trajectory of political polarization in the American public, and how it interrelates with government, society and people’s personal lives. This report uses cluster analysis to sort people into cohesive groups, based on their responses to 23 questions covering an array of political attitudes and values. First developed in 1987, the Pew Research Center’s Political Typology has provided a portrait of the electorate at various points across five presidencies; the last typology study was released in May 2011. Over the course of 2014, the project will further explore the various factors that contribute to – or stem from – political polarization. A September report will examine how political polarization is linked to people’s information environments: Their news sources, social media habits and interpersonal communication networks. Other reports will look at how political polarization relates to where people live, their political environments, how they view themselves and others around them, their socioeconomic circumstances, generational changes and broader sociological and psychological personality traits. The data in this report are based on three independent survey administrations with the same randomly selected, nationally representative group of respondents. The first is the center’s largest survey on domestic politics to date: the 2014 Political Polarization and Typology Survey, a national telephone survey of 10,013 adults, on landlines and cell phones, from January through March of this year. The other two surveys involved impaneling subsets of these respondents into the newly created American Trends Panel and following up with them via surveys conducted by web, mail and telephone. The surveys are described in detail in the About the Surveys section of the report.